I hope you are still standing after yesterdays earthquake? The quakes and weather this year has really been disastrous. Even though it has been a lot I think we have all recovered well from it. But, because of this years history I think it is OK to be a little worried even when there is just a small quake. The weather might be harsh from time to time. But don’t worry here at Oiran studio Miyabi we stay strong. One of the things that really gives me energy in the morning is knowing I will be coming here and meet you. helping you get Oiran-Style pretty is something that I with love more than anything. Another thing I absolutely love is to be creative. Every chance I get I paint or make something. Just anything, I would say that I am probably a real DIYer. Sometimes I get the chance to be really creative and make things for you all to enjoy. 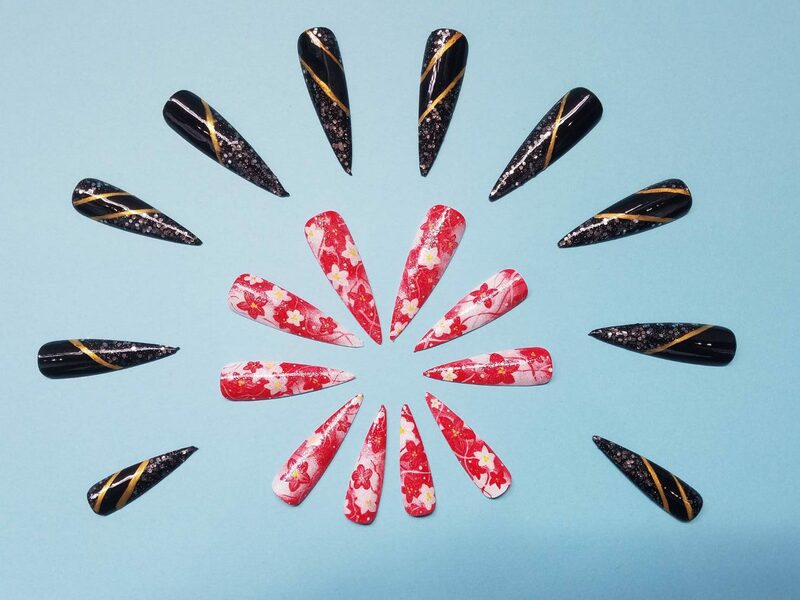 For example, I put a lot of love and effort in making new nail-tips that you can enjoy when you come here. Nail-tips is a super nice option you can choose here if you want to make you fingers look longer and more stylish. We have a lot of different nail-tips to choose between. In the picture below you can the latest addition to our nail collection. Much much love from me Sara and of course everyone else here at the studio.